Objective: The objective of this experiment was to determine if alcohol has any negative affects on zebrafish development in order for them to serve as a model for fetal alcohol syndrome in humans. Fetal alcohol syndrome is a condition caused by mothers consuming alcohol while pregnant. The detrimental affects of this syndrome are known on humans, such as growth retardation, face abnormalities, sensory deficits, impaired fine motor skills, and learning disabilities. Between ethical concerns regarding giving pregnant mothers alcohol which negatively harm their unborn child and unreliable reports by mothers who did drink while pregnant, a model organism is needed to better understand the effects of alcohol on a growing fetus. Thus, this experiment aims to see if zebrafish can serve as an effective model organism for this condition. Current literature points to zebrafish being a superior model organism for Fetal Alcohol Syndrome due to it's transparent eggs and ease of introducing the ethanol to the zebrafish. With rat or mice models the pregnant rats must have their blood alcohol checked regularly to see if if the embryos are being exposed to the right concentration of alcohol. Zebrafish by contrast take in the ethanol from their surroundings, preventing the researcher from having to check a mother for blood alcohol levels. Additionally zebrafish can breed large quantities and grow up exceptionally fast, allowing an experiment to be done very quickly and in a large number. It is known that zebrafish exposed to alcohol while an embryo have higher mortality, smaller eyes, smaller body lengths, changes in heart rate, and more structural abnormalities. The results from this lab will be compared to these results to see if they hold true under additional scrutiny. Day 1, 2/19: Two petri dishes were set up, one containing 10 mL of a 1% alcohol solution and a control containing 10 mL of distilled water. The movement and life stage of 5 eggs from each group were analyzed with the naked eye. Day 3, 2/21: The dead eggs were removed and the number of zebrafish that hatched were counted from each group. The yolk absorption, life stages, and movement of 5 zebrafish were taken with a mixture of egg and hatched fished chosen. They were analyzed with the naked eye. Day 6, 2/24: The solution in each dish was pipetted out and replaced with 10 mL of each respective solution. Any dead fish were removed and disposed of. The number of remaining fish was counted. The movement, yolk absorption, color and pigmentation of 5 zebrafish from each group were analyzed with the naked eye and recorded. Day 8, 2/26: The number of remaining fish was counted. Four zebrafish from each group were pipetted onto a wet mount and observed under a microscope. 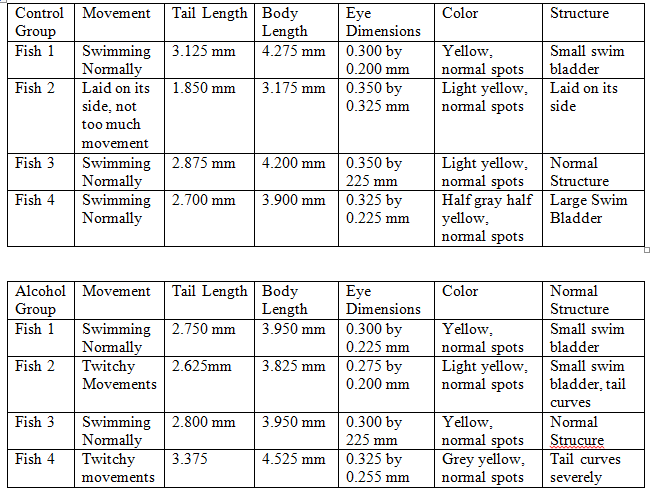 The tail length, body length, eye diameter, color, pigmentation, and structure were recorded. Two zebra fish from each observed group were selected to be anesthetized and preserved in formaldehyde. Day 10, 2/28: The solution in each dish was pipetted out and replaced with 10 mL of each respective solution. Any dead fish were removed and disposed of. Four zebrafish from each group was pipetted onto a wet mount and observed under a microscope. The tail length, body length, eye diameter, color, pigmentation, and structure were recorded. Two zebra fish from each observed group were selected to be anesthetized and preserved in formaldehyde. Day 14,3/4: Any dead fish were removed and disposed of, with the better preserved ones being preserved in formaldehyde. The solution in each dish was pipetted out and replaced with 10 mL of each respective solution. Any salvageable dead zebrafish were preserved in formaldehyde. Day 15, 3/5: All the dead fish were disposed of. All the preserved fish from previous experiments were remeasured to insure accuracy. 20 eggs are in both dishes. In the control group 1 egg died, leaving 19 zebrafish alive. 10 hatched while 9 remained in their eggs. In the alcohol group 2 eggs died, leaving 18 zebrafish alive. 10 hatched while 8 remained in their eggs. In the control group all the eggs hatched, however 1 fish died leaving 18 left. In the alcohol group all the eggs hatched, however 2 fish disappeared leaving 16 left. In the control group 18 fish were alive, however 1 was lost while analyzing it and 3 were preserved so 14 were left. In the alcohol group 16 were alive, with 3 being preserved 15 were left. In the control group 14 fish were alive, two were sacrificed to be preserved so 12 remained at the end. In the alcohol group 2 had died between labs leaving 11 left. Of those 11 two were selected to be sacrificed to be preserved so 9 remained. There was a mass die off since the last time the zebrafish were observed. The control group had only three zebrafish left and the alcohol group had no zebra fish left. The remaining three zebrafish did not appear to be healthy, they did not move much. They were not measured. The three zebra fish from last time died. Attempts were made to look at preserved samples from Day 14 but the bodies were too decomposed to make accurate measurements. Overall, the biggest difference observed between the two groups was the movement. The alcohol zebrafish had much twitchier movements than the control. While the control zebrafish would move in clean, fluid motions the alcohol zebrafish would rock back and forth slighlty while moving. From the other variables both groups ran about the same. As stated previously the most noticeable difference between the two groups was the movement of the fish. The alcohol fish were jerky and would make movements that would remind one of a seizure. The alcohol fish moved slower too, making them much easier to capture than the control fish. While this does not directly connect with what was expected it does represent a negative affect the alcohol group had that the control didn't. Thus, the impaired movement of zebrafish could be factor in fetal alcohol syndrome among zebrafish. 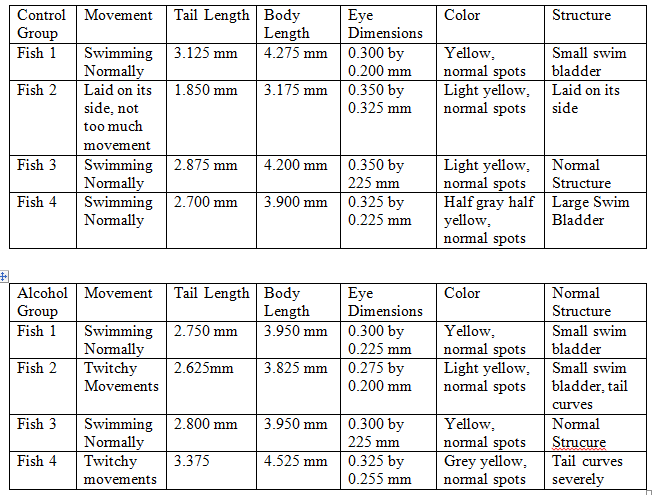 From the data it appears that for tail, body, and eye size the two groups were about even. Interestingly the size of the fish did not appear to go up too much between 2/26 and 2/28. In fact, the average size went down as all the fish from 2/26 had a body length of at least 4.000 mm. The 2/28 fish however, had several fish that did not break that length in both the control and alcohol groups. This could be due to human error as it is unlikely that all the fish shrunk. Instead the fish may have been measured differently between the two days, overestimating on the first and underestimating on the second. Unfortunately, the next day the fish were meant to be observed, 3/4, had a massive die off that killed off the vast majority of the remaining fish. The bodies were so badly decomposed that accurate measurement was impossible. Thus, there is a gap in the data that may have shown results. While the cause of the die off is unknown it obviously was environmental to both dishes as they were almost equally affected. While three control fish did live, as they died by the next day it was determined not to be significant. Another factor that could have shown a difference was the rate of abnormalities. 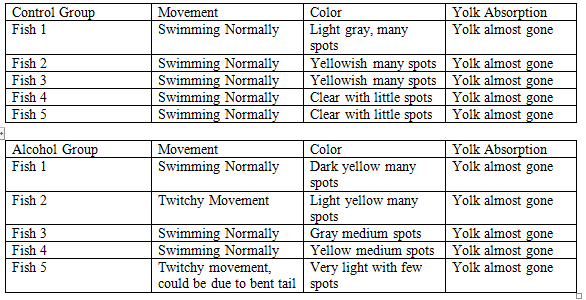 However, several fish from each group had bent or curved tails as well as abnormalities of the swim bladder with the total being 5 control fish as being not structurally normal and 7 alcohol fish being not structurally normal. Seven to five is not enough data to show that the alcohol made a difference, obviously structural abnormalities are a natural process for it to affect both groups. The coloring and pigments of the fish appeared normal throughout the experiment with the exception of the control 4 fish from 2/28 that was half gray and half yellow down the middle. While this particular fish did have a large swim bladder it is unknown if the two are connected. The data on yolk absorption, life stage, hatching, and death rates also appeared to be constant throughout both groups. On 2/21 and 2/23 disappearances and deaths were common in both. No late hatching, yolk absorption, or life stage development was observed among the alcohol group. While heart rate, eye movement, and eye pigmentation was recommended to be observed all three variables proved to difficult to observe. For many zebrafish the heart was too small to locate and count. Thus, any data that was gathered was made useless as there wasn't much to compare it too. The eyes movement and their pigment suffered a similar issue as the eyes could only be observed from above with no way of knowing if the eyes were different or not besides size. Thus, these three variables were excluded from the data sets. With all this data analyzed it was soon realized that the main problem of this experiment was scale. The populations of zebrafish used were too small to account for random deaths or mutations that would naturally whittle down the numbers. With only four zebrafish observed critically under the microscope per day it is unknown how the entire population was doing and if the alcohol group did have more abnormalities or defects than the control group. Additionally, with only two days of microscope observation and the massive die off it is unknown if any more symptoms would arise in the alcohol group compared to the control group. It is recommended that this experiment be repeated again, this time with more zebrafish and all the fish observed under the microscope in order to get enough data to see if there are more difference between the the two populations than movement. Increasing the alcohol concentration too could help, perhaps the 1% concentration used was too low. Additionally, the zebrafish should be kept in a more hospitable location in order to prevent another die off which greatly impacted the data collection. While impaired motor skills is a sign of fetal alcohol syndrome in humans and was observed among the alcohol zebrafish, this set up is clearly not effective enough to serve as a proper model for humans. There were too many errors and not enough evidence such as a size difference or an increase in physical abnormalities to reflect what is known to affect humans. Human error may have been large assessing the size difference as the average size went down and not up as it should have over a two day gap. Nevertheless, if the above measures are followed, zebrafish could be useful. Until then, more research must be done in order to optimize conditions. The object of this lab was to run the DNA sequence of two samples, the black bacteria colony from 10^(-5) tetracycline free plate and the green colony from 10^(-3)tetracycline plate in order to better determine their species. Qualitative: While this individual strain was not observed under the microscope it was at least determined to be green. Quantitative: From research, Psedudomonas Putida is a rod-shaped and gram negative soil bacteria. Because the black bacteria did not give any kind of fragment another group's data from the same transect was used. Qualitative: Unknown as this sample did not come from our petri dishes. 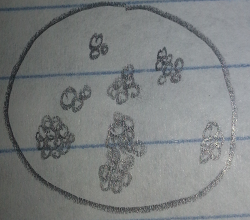 Quantitative: This species is gram negative and rod shaped. Both of these samples are consistent with the data collected from the earlier labs. The white-Opaque Colony, 10^(-7) Tetracycline Free Plate bacteria was rod shaped and pink after gram staining, making it a gram negative species and consistent with both DNA fragments run. The objective of this lab was to understand invertebrates and how they differ. Also, invertebrates that were collected from the transect were analyzed to see the diversity of invertebrates in the transect. It was hypothesized that at least two different kinds of invertebrates will be observed. Pseduocoelomates, Nematode: The nematodes did not move much under the microscope. A few gave a twitch or two but besides this they were still. Coelomates, flatwords: The flatworms moved in a wave like pattern where the body would move up and down much like a sin wave in mathematics. The used this wave motion to propel themselves into the egg yolk particles in order to eat them. Coelomates, Earthworm: The flat worms moved in a sliding fashion. They would push the front half of their body and then slide the back half forward. The earthworms were able to move their heads in a fashion that was independent of the rest of their body. From the cross sections it can be determined that the more complex the body of the organism the more complex the movement. The flatworms had the most simple body as they did not have a coelom. They also had the simplest movement as they were only able to make wave motions using their entire body. The earthworms by contrast had an advanced coelom and the most advanced movement as they were able to move different parts of their body in different directions. It was difficult to tell about the nematodes as they did not move besides the occasional twitch when they were observed. It should be pointed out that the Berlese Funnel from the transect did not deposit any invertebrates. 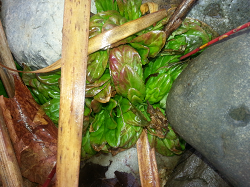 It is assumed that since the leaf liter was collected on a day of heavy rain that the rain washed away all the organisms. To compensate for this samples from West Virginia were used instead. The sizes of the samples ranged from roughly 1 mm to roughly 7 mm. The largest orgnaims observed was the house fly at around 7 mm while the smallest organism was the lice at about 1 mm. All of these organisms are arthropods. While other groups of organisms may exist in Berlese funnel leaf litter these were the only organisms sampled. While there was some diversity among the invertebrates collected, more was expected. All the organisms observed were arthropods, no spiders or mites were observed. This may be due to the small sample size as only 5 organisms were observed. To get a better estimates of the diversity more invertebrests should be analyzed. Five invertebrates who might inhabit the transect include the song sparrow, robins, raccoon, eastern gray squirrels, and red tail hawks. While none of these animals were directly observed at the transect they have been seen around campus or are known to live within Washington DC. 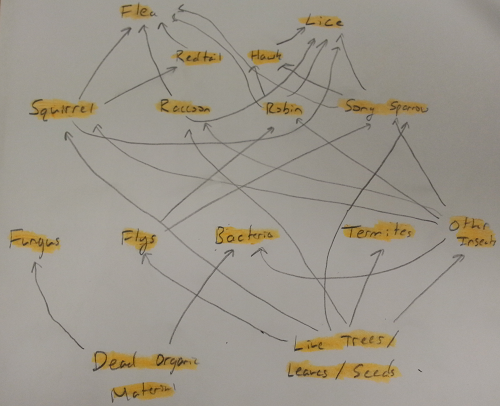 From this information a crude food web was created using organisms from the transect. The objective of this lab was to understand the characteristics and diversity of plants and fungi. It is predicted that the transect will provide a variety of different vascularzations and cotyldeons. 3)Collected five separate plants samples including but not limited to leaves, seeds, branches, flowers, etc. This plant is a tall reed of some sort with long, thin blade like leaves (figure 1). The plant has a long center stalk that was about should height from which everything grows off of. The stalk and leaves are a dull brown, most likely because the plant is dead due to it being winter. The leaves were only about as wide as a pencil but were almost as tall as the center stalk. 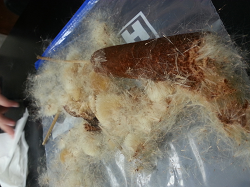 There is a mud brown fuzzy cylinder near the top of the stalk. While the roots/stem of the this plant were not analyzed based on it's height it is assumed that this plant has vascular tissue as water and nutrients would need to be transported from the top to the bottom of the plant and vice versa. As seen in Figure 1 the leaves of this plant are long and thin and grown from bottom to middle of the stalk. The leaves do not appear very numerous, only a few grow from the stalk. Upon further investigation of the fuzzy cylinder (figure 1 and 2) it was discovered that this was a tube of very fine seeds. It appears that these seeds would be dispersed by blowing in the wind. From the plant leaves it was determined that the plant was monocot as the leaves had parallel veins. These plants are located in the wet and marshy area of center of the transect. This plant was tall, overshadowing plant 1. The plant had a bare stalk but a bushy head full of either leaves, buds, or small flowers, all of them brown and withered. While the roots of the plant were not analyzed it is assumed that this plant has vascular tissues as water and nutrients would need to be transported up and down the plant. The brown leaves on this plant are incredibly small, they are about the length of a finer nail and about as wide as two toothpicks (Figure 4 and 5). The leaves are interspersed among the small buds all along the branches of the plant (figures 4 and 5). Upon further investigation of the leaves it was determined that the small buds were little flowers indicating that the plant is an angiosperm (figure 5). It was determined from the leaves with the parallel veins and not the flowers that the plant was a monocot as the flower were too small and shriveled to observe the petal pattern. No seeds were observed. This plant was located in the same marshy area as plant 1. This plant was a shrub or small tree with red bark that grew to about chest height(figure 6). While the roots of the plant were not analyzed it is assumed that this plant has vascular tissues as water and nutrients would need to be transported up and down the plant. A few withered leaves appeared on the branches(figure 6 and 8). 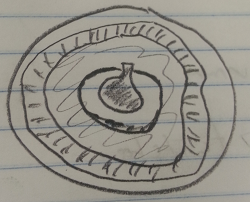 They were a dark green, oval shaped, and about the size of two thumbs together. A central vein went down the leaves,with a network of veins leading off indicating that this plant is dicot (figure 7) . While only a few leaves remained near the tips of the branches, markings along the bark indicated locations where other leaves could have once been all along the branches (figure 8). A few small brown buds were observed as the only reproductive parts of the plant, figure 6. 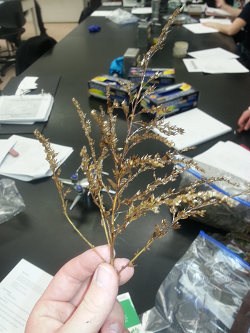 This plant sample was located on the left hand side of the transect near the edge of the grass/rock line. 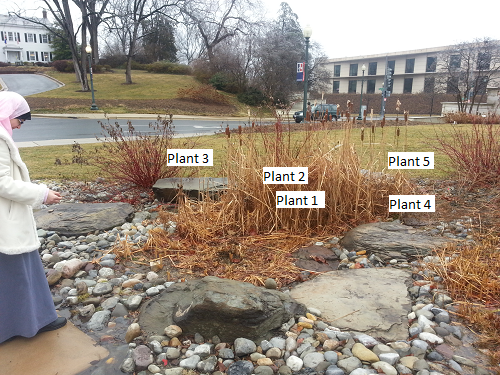 This plant was a very low lying plant that grew among the rocks (figure 9). The roots of this plant were observed and it is thought that this plant has vascular tissue. The leaves of this plant are bright green and are about half a finger long (figure 10). 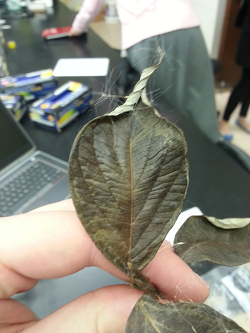 The plant is a dicot as there is a central vein on the leaf that other veins branch off of (figure 9). It was hard to determine if there was a stem on this plant, the leaves grew so thick and close together that it was like having a ball of leaves (figure 10). 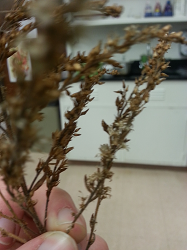 No flowers, buds, or spores were observed on this plant. This plant was located among the rocks to the right on the marshy area near the border between the grass and the rocks. 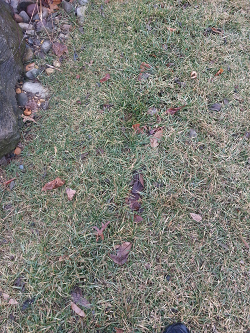 This plant is a grass, the normal kind observed on the ground, growing only about two inches high(figure 12). 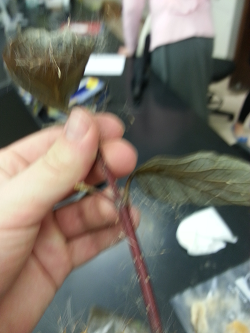 The roots of this plant were observed and it is thought that this plant has vascular tissue. The leaves of this plant are green and very narrow, about half a pencil width. 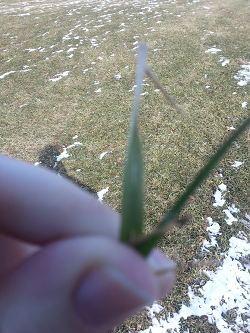 The leaves/blades of grass are not that close to each other, it is almost like each blade is its own plant. The plant is a monocot as the veins in the leaf run in a parallel direction. 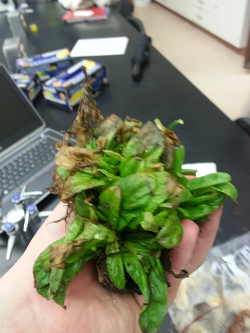 No flowers, buds, or spores were observed on this plant. The plant was located in the grassy area at the top of the transect. This sample had white fibers and small black dots on the fibers. Plant 1 was determined to be a cattail. Cattails do have flowers so they are a monocot angiosperms. 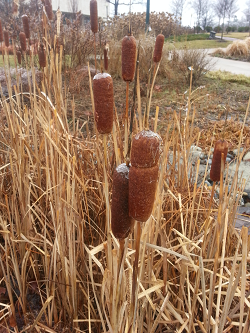 The scientific name for cattails is T. angustifolia (http://www.cattails.info/). Plant 2 was determined to be a monocot angiosperm. The exact genera for this species was unable to be determined from the information provided. 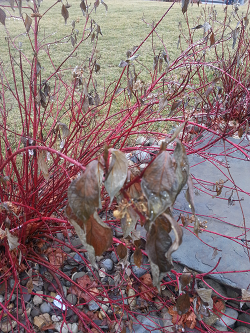 Plant 3 was determined to be a Redtwig dogwood or Cornus alba (http://www.finegardening.com/plantguide/cornus-alba-elegantissima-red-twig-dogwood.aspx). Redtwig dogwoods are dicot angiosperms. 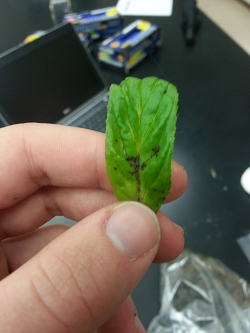 Plant 4 was unable to be identified but it is assumed to be a dicot angiosperm. This is because based on the plant and it's structure it seems highly unlikely to be a gymnosperm and the leaf structure did not resemble those of ferns. Plant 5 is known to be a type of grass as it was torn out of the lawn. Therefore, plant 5 is a monocot angiosperm (http://en.wikipedia.org/wiki/Poaceae). The prediction was validated in that we did find a mixture of monocot and dicot plants. However, it was also discredited because all the plants sampled were vascular plants. This may indicate that the transect is very complex and that organisms need a high level of order and specialization in order to survive. Fungi sporangia are small, black balls formed from the white hyphae filaments. They contain spores which are released once the sporangia open up. Based upon figure 14 it is theorized that the fungus in question is black bread mold, a kind of zygomycota. It is believed to be a fungus as it has wispy white filaments and small black dots. These are the hyphae and sorangia, structures only found in fungi. The objective of this lab was to learn the differences between bacteria based on physical shape and the presence, or lack of, an outer peptidoglycan layer. Also, this lab explores antibiotics and how they could affect bacterial growth in an agar plate. It is predicted that there will be a diverse group of bacteria, as in more than 2 shapes and a mixture of gram negative or positive colonies, and that there will be less colonies on the agar plates with tetracycline. 2)Counted number of colonies formed on agar plates. For small number of colonies they were outright counted, However, for plates with large number of colonies the plate was divided up into sections and the number of colonies found in a section multiplied by the number of sections to find the total number of colonies on a plate. 1)Compared differences between plates with the same concentrations but with or without tetracycline present. 4)Observed bacteria colonies under the microscope. 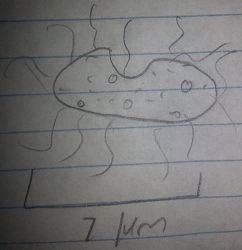 This was done to determine the size and shape of the bacteria. 5)Made gram stain for the bacteria by first drying the slide under a flame for several seconds. Then, the bacteria was stained with crystal violet. The crystal violet was washed off with water and then covered with Gram's iodine mordant before being washed with 95% alcohol. Finally, the bacteria was covered with safranin strips and then washed. 6)The bacteria samples post gram stain treatment were observed under the microscope to determine size and shape. 1)Selected the black bacteria colony from 10^(-5) tetracycline free plate and the green colony from 10^(-3)tetracycline plate for PCR sequencing. 2)Selected colonies were transferred into 100 microliters of water in a sterile tube and incubated for 10 minutes in 100 degree Celsius water bath. Hay infusion: The hay infusion's water was much darker than before and some appeared to have evaporated as there was residue on the wall of the container. The water also appeared to be more homogeneous, there was only a slight discoloration of the water near the bottom among the organic debris. There still appeared to be algae like growth on the top of the surface. The container smelled less than it did last time. There appeared to be several differences between the normal agar plates and the ones with tetracycline. First, there were several fungus spores on the 10^-3 and 10^-7 tetracycline plates. The colonies on the tetracycline plates also appeared to be smaller and less numerous than those on the normal nutrient plates. The orange and white bacteria appeared on both kinds of plates while the clear bacteria appeared on the tetracycline free plates only. There was a solitary pink colony on the 10^-3 tetracycline plate. Pink Colony, 10^(-3) Tetracycline Plate: This pink colony appeared tear shaped, convex, and very smooth. 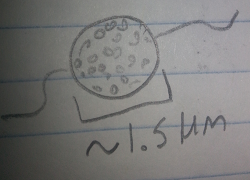 On the first microscopic observation the bacteria appeared very small, round, and squished together with no movement. The bacteria was guessed to be a cocci species. After the gram-stain test it was found that this bacteria is purple, making it gram positive, and spherical with clusters. This meant the bacteria is a definitely a Bacilli bacteria, specifically staphylococcus. 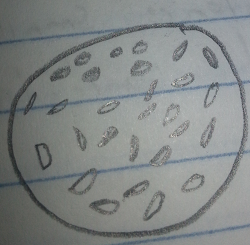 Orange Colony, 10^(-5) Tetracycline Free Plate: This orange colony was circular, convex, and smooth. On the first microscopic observation the bacteria appeared very, very small and squished together. 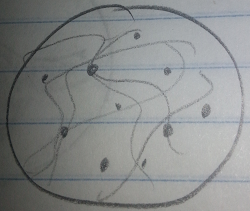 There was no movement noticed but a few squiggle shaped objects were observed among the small bacteria. The bacteria was guessed to be two separate bacteria species, a cocci and a spirilum. After the gram-stain test it was found that the bacteria was spherical and pink, making it gram negative. The odd squiggles noticed in the pre-gram stain wash also disappeared. From the evidence gathered in the gram stain observation it was determined that the bacteria was a cocci, possibly a staphylococcus. White-Opaque Colony, 10^(-7) Tetracycline Free Plate: This white-opaque colony bacteria was very small, squished together, and had no movement. The bacteria was guessed to be a cocci species based on this evidence. After the gram-stain test it was found that the bacteria was rod shaped and pink, making it a gram negative species. This new evidence suggested that the bacteria was a bacilli, specifically diplobacilli. The change in smell of the hay infusion could be because the top was left open on the jar allowing for more oxygen to get in. This would allow more aerobic organisms to flourish rather than anaerobic organisms that could smell worse. Also, the availability of nutrients could have shifted as all the food originally in the water was consumed. This might allow more producers to thrive and clean up the smell and color of the water. It is predicted that if Archea were placed on the nutrient agar plates they would not grow. Archaea grow in extreme conditions and would not flourish under such mild conditions. They would either need temperatures too high, temperatures too low, salt content too high, or any other kind of specific range that this lab cannot provide. Also, competition from normal bacteria would prevent the Archaea from gathering the nutrients required for growth and lead to the death of all Archaea as the normal bacteria are much better suited for this environment. The tetracycline definitely had a negative influence on the size difference of the bacterial colonies and their frequency, backing up our original prediction. The tetracycline free plates were much more populated indicating that some of the bacteria was killed off by the tetracycline. As only the 10^-3 and 10^-5 plates grew bacteria we can only compare their data with the plates of equivalent dilution. The 10^-3 tetracycline free plate grew about 40 times as much bacteria as compared to the plate with the antibiotic and 10^-5 plate grew about 50 times as much bacteria compared to its antibiotic free plate. Thus, bacteria are able to live on tetracycline plates, just at a reduced rate of growth. Based on the colors it appears that the clear colonies will only grow on tetracycline free plate while the pink colonywill only grow in the presence of tetracycline, specifically the 10^-3 plate. The orange and white-opaque bacteria appeared on both plates. As for fungi, they only appeared on the tetracycline plates. This is not surprising as antibiotics do not affect fungus as they only kill bacteria. Since there were fewer bacteria present than in a normal plate the fungus had an advantage and were able to flourish. On the normal plates the bacteria had the advantage and were able to kick out the fungi. The antibiotic tetracycline works by inhibiting the synthesis of proteins. It does this by binding to the small 30s ribosomal subunit found in bacteria. When tetracycline binds to the ribosome it prevents the synthesis of proteins by blocking tRNA from coming in and binding to the ribosome. Thus, while tetracycline does not outright kill the bacteria it prevents it from producing proteins which will cause the cell to die when vital proteins do not get synthesized. Tetracycline is able to affect both gram negative and gram positive bacteria as both outer layers allow the tetracycline to enter, either though porins or diffusion. The bacteria were very difficult to observe without the gram staining. The bacteria were so squished together it was hard to tell if it was part of the actual arrangement of the bacteria species or from just the density of the bacteria. With the washing however enough bacteria was cleared away to allow better observation of the bacteria. This even changed to shape seen as with the white-opaque bacteria they were originally thought to be spherical when in fact there were rod shaped. Also, the gram staining colored all the cells making them easier to see than without any kind of dye. Our original hypothesis was also proven as we saw both gram positive and gram negative bacterial strains along with two kinds of bacteria species. The two that were the same, cocci staphylococcus, even differed on how they were gram negative or positive indicating that even among bacterial species there is great diversity. It is assumed that there will be some difference in the 16s RNA gene between the two bacteria species. Many bacteria groups have different sequences for this gene so it is predicted that two genes of different length will be discovered. Learn how to identify algae and protists through physical characteristics. After the acquisition of necessary identification skills, two different samples were taken from the hay infusion prepared in the previous lab and analyzed for protists and algae. It was hypothesized that there would be more aerobic producers near the sample from the top of the jar as the organisms would have access to sunlight and oxygen in addition to several consumers that would eat the producers. Anaerobic consumers would be found more in the sample from the bottom of the jar where there was lots of dead organic material to eat, less oxygen, and a little sunlight. With so much food on the bottom and little sunlight/oxygen there would be no use for there to be many producers. Once the protists and algae were discovered they were then identified using a dichotomous key. 1)Obtained and labeled four normal agar plates 10^(-3), 10^(-5), 10^(-7), and 10^(-9). Also obtained and labeled four tetracycline coated agar plates Tet 10^(-3), 10^(-5), 10^(-7), 10^(-9). 2)Obtained four tubes of 10mls sterile broth and labeled 2,4,6,8. Example Organism 1: The first organism was about 35-30 micometers long. It was determined to be a Peranema after consulting the Dichotomous Key. 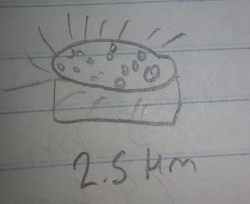 Example Organism 2: The first organism was bout 5 micometers long. 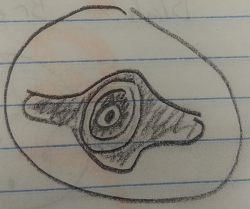 It was determined to be a Euglena after consulting the Dichotomous Key. Observations of Hay Infusion- The infusion smelled like mold or old seafood, an overall unpleasant odor. There was some algae or other plant growth on the surface of the water and under it creating a whitish film. Overall the water near the top was very cloudy. There were two small sprouts growing out of seeds that were on twigs above the water surface. The middle layer of water was transparent, but colored like weak tea. The bottom of the jar contained lots of sediment from the fallen leaves and other organic debris. Samples- Two samples were taken from the hay infusion, one near the top of the water line right under the white film and the other at the bottom among the sediment. 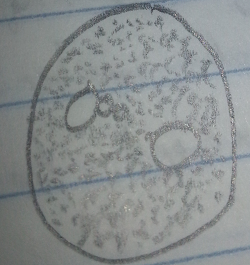 Top Organism 1: This organisms was motile and was bout 5-6 micrometers long. From its features it was determined to be a Euplotes, a nonphotosynthesizing protozoa. 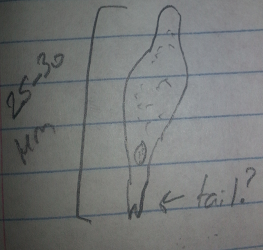 Top Organism 2: This organism was motile and only about 2 micrometers long. From its features it was determined to be a Colpidium, a nonphotosynthesizing protozoa. 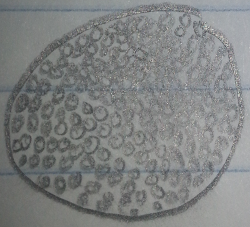 Top Organism 3: This organism was motile and about 7 micrometers long. From its features it was determined to be a Colpidium, a nonphotosynthesizing protozoa. 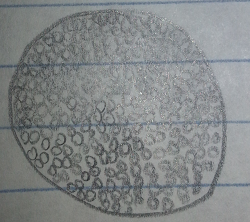 Bottom Organism 1: This organisms was gray, motile, and about 2.5micrometers long. From its features it was determined to be a Colpidium, a nonphotosynthesizing protozoa. 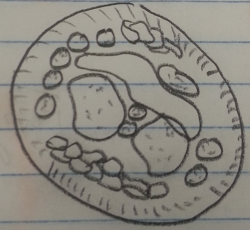 Bottom Organism 2: This organism was green, motile, and about 1.5 micometers long. From its features it was determined to be a Chlamydomonas, a photosynthesizing green algae. Bottom Organism 3: This organism was gray, motile, and about 3.25 micometers long. From its features it was determined to be an Ameoba, a nonphotosythesizing protozoa. The original hypothesis was wrong, the only producer observed in the sample came from the bottom of the jar, not the top. This may be because the white film/cloudiness of the water near the top was due to macroscopic organisms, not microscopic ones like the chlamydomans. Then, the consumers, such as the colpidium, would eat the producers. On the bottom however, there may not actually be as much nutrition or competition for producers and as such the chlamydomans can capture a better niche. Thus, in the long term there may be selective pressures for more producers once the available nutrition for consumers runs low. If the hay infusion was allowed to continue on for longer I would expect to see more producers and less consumers. This is because the consumers will eat all the available nutrients from the infusion and more producers would be needed to provide food. I would also expect larger and more complex organisms to grow. This is because as the hay infusion continues the organisms that are will suited to the environment will grow larger and start to dominate over the general organisms. Thus, the organisms in the niches will become more complex and suited for that role than the earlier generalists. While no plant matter was removed for inspection, it is hypothesized that more consumers would be found near them. This is because the plants take in all the nutrients other producers, such as chlamydomonas, would use. This leaves only the consumers to eat the plants and its byproducts by the plants. From the Freedman text organisms must 1) acquire and use energy 2)are made up of cells 3)process information 4)are capable of replication 5)are a product of evolution. The second Colpidium, Top Organism 3, follows all these rules. 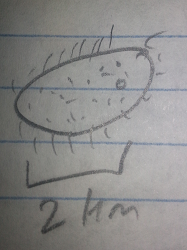 The organism moved around using its cilia, a process that requires the use of energy proving point 1. 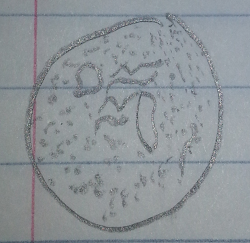 It also appeared to be made of a single cell, fulfilling number 2 and 3. To be made from a cell the Colpidium must be made of DNA meaning it has a hereditary path for information, aka DNA. While no replication was observed, multiple Colpidium of the same species were located meaning that the organism must replicate in some manner, number 4. The final point is hard to prove after just several minutes of observation, but the fact that another Colpidium species was observed gives evidence to evolution. The two species differed in both size and shape, with the second one having a cleft on one side of its body. If both species came from one common ancestor they must have diverged somewhere along the way. While the results from the serial dilution will not be known until the next lab, it is assumed that less bacteria will grow on the plates with tetracycline as tetracycline is an antibiotic and will kill most bacteria. Also, less bacteria will grow on the plates with lesser concentrations as there are less different bacteria to form colonies with. Great characterization of your transect! Make sure you include pics of lab 1 and lab 2 by Sunday. 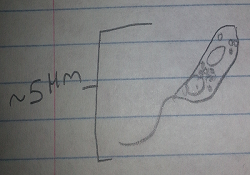 Also, start working on building a map of your transect to detail your land and where your samples are taken from. We will talk about this more Wednesday. Objective: Observe a transect of the AU campus with regards to its biotic, abiotic, and other general features. By looking at a 20 ft by ft square of land here at AU we can observe how organisms and the environment interact within a specific section of land. 4)Made a hay infusion culture by mixing 10 to 12 grams of the soil sample and placing it in a plastic jar with 500 mls of deerpark water. Then, 0.1 gm dried milk was added and gently mixed for about 10 seconds. The jar was capped and set aside to culture. The plot observed was located next to Kogod alongside the footpath in the grass/vegetation area along Massachusetts Avenue. Abiotic components: About half the plot was in shade at that time of the day, about 1:15pm. The soil near the cattail was very wet and damp, the area appears to be a runoff area as there is a drain located right outside the limits of the plot. Several different types of rocks appeared in the area. When facing Massachusetts Avenue there was a patch of very small, only a few inches across, rocks that were surrounding two larger boulders on the lower left hand side of the plot. The area closer to Kogod will be the lower side, the side closer to Massachusetts Avenue the upper side. To the right of this small stone patch was another stone patch, this time with rocks about the size of two or three fists. Three large, flat boulders appeared in this area. There is lots of exposed soil near the stone patches. Biotic Components: There is a triangle of grass in the upper left side of the plot that takes up about ¼ of the plot. There is very little besides grass in this area in terms of life. On the very left border of the plot and in the middle of the plot on the grass/dirt border there are two red barked shrubs that did not have any leaves. 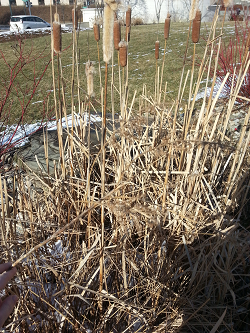 On the middle to the right hand side of the plot in the stone/dirt area there is a small thicket of cattails. Among the cattails there are a few small plants that may be weeds. To the right of the cattails are a several very small plants that hug the ground. On several of the rocks either a moss or algae is growing, likely due to the large amounts of water the area gets. 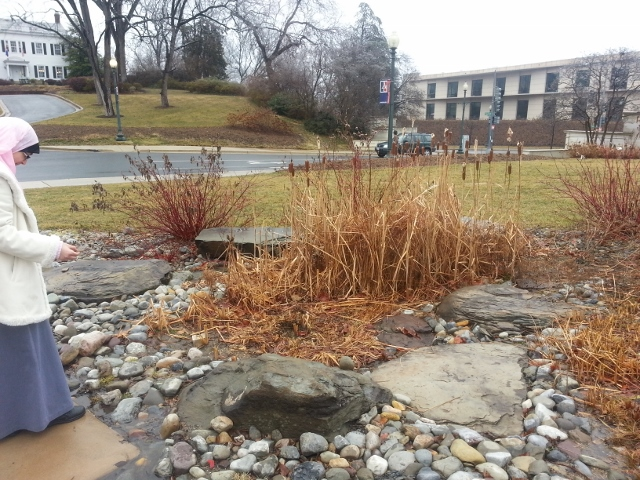 Lots of organic matter, such as dropped leaves, sticks, or other dead plant material, litter the ground in the stone area and among the cattails. In short, most of the plot is either grass or a field of stones of various sizes. Two red shrubs and a thicket of cattails dominate the biological scene. The area appears to get lots of water due to the slope of the surrounding land leading runoff into the plot. Other studies will be performed using the hay culture created in this lab to observe the microorganisms located in the plot. Also, the plot will be revisited later to see if there are any changes to it. This page was last edited on 21 March 2014, at 19:46.